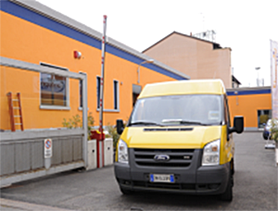 The new headoffices in Viale Certosa, Milan, opened in September 2010, suggests Livolsi’s high quality service. The service centre, on 2000-sqm wide area, of which over 200 are dedicated to customer care. 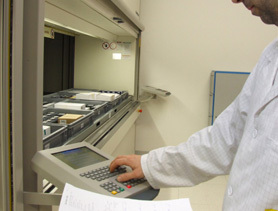 Labs, 700 sqm large, are organized in order to guarantee the best quality of service. Compliant with ESD rules and with workbenches operating in EPA area, they are provided with highly advanced equipment (Rework, QC, Test, Adjustment, Fault detection and Calibration) to provide all levels of repair (Repairs, BGA soldering, Inspection, Failure analysis, Quality Control). The court, with limited access to authorized vehicles and couriers and dedicated loading/unloading area, ensures comfortable and practical logistic activities. All operating departments are reached by a pneumatic transfer system that allows to send products and spare parts for repair from and to laboratories. In only 25 sqm, the 250-sqm large domotic warehouse! 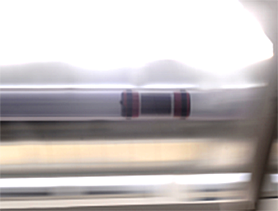 The automated system allows the automatic retrieval, storage and reorder of spare parts.